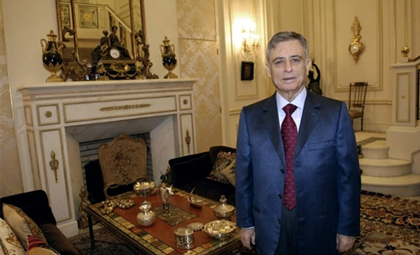 Uprooted Palestinian: Does Abdul Halim Khaddam Have Anything to Do with What's Going on in Syria? Is Saudi Arabia Showing George W. Bush How to Run the Regime-Change Table in the Middle East? Saudi Arabia has engaged in some extremely public and forceful pushback against Middle East unrest in general and Iran in particular on the issue of Iran. In some quarters, it’s being called the Saudi counter-revolution. Is the pro-Iran/pro-Hezbollah Assad government in Syria the next Sunni domino? Iran’s Press TV certainly thinks so. Saudi Arabia, which often bows to US and Israel's policies in the region, tried to destabilize Bashar al-Assad's government by undermining his rule. To this end, Saudi Arabia paid 30 million dollars to former vice president Abdul Halim Khaddam to quit Assad's government. 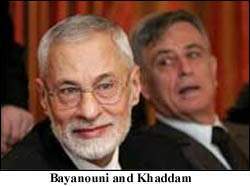 Khaddam sought asylum in France in 2005 with the aid of Saudi Arabia and began to plot against the Syrian government with the exiled leaders of the Muslim Brotherhood. Khaddam, who is a relative of Saudi King Abdullah and former Lebanese premier Rafiq Hariri, used his great wealth to form a political group with the aim of toppling Bashar al-Assad. The triangle of Khaddam-Abdullah-Hariri is well-known in the region as their wives are sisters. Khaddam's entire family enjoys Saudi citizenship and the value investment by his sons, Jamal and Jihad, in Saudi Arabia is estimated at more than USD 3 billion. Therefore, with the start of popular protests in Tunisia, Egypt, Libya, Yemen and Bahrain, the Saudi regime saw an opportunity to drive a wedge between Tehran, Damascus and Beirut axis. 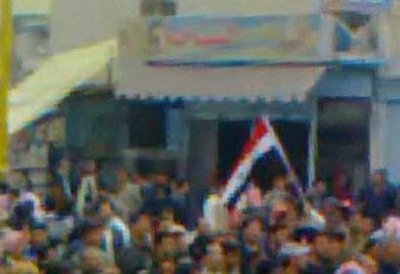 Due to the direct influence of the Saudi Wahhabis on Syria's Muslim Brotherhood, the people of the cities of Daraa and Homs, following Saudi incitement and using popular demands as an excuse began resorting to violence. It is reported that the United States, Israel, Jordan and Saudi Arabia formed joint operational headquarters in the Saudi Embassy in Belgium to direct the riots in southern Syria. Abdul Halim Khaddam, who held the highest political, executive and information posts in the Syrian government for more than 30 years, is said to have been transferred from Paris to Belgium to direct the unrest. 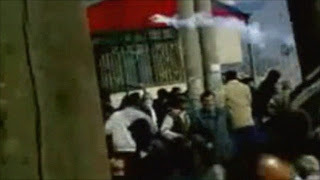 The reason for this was that based on French law, political asylum seekers cannot work against their countries of origin in France and therefore Khaddam was transferred to Brussels to guide the riots. Jordan equipped the Muslim Brotherhood in the two cities with logistical facilities and personal weapons. Although, Bashar al-Assad promised implementation of fundamental changes and reforms after the bloody riot in the country, the Brotherhood followed continued to incite protesters against him. 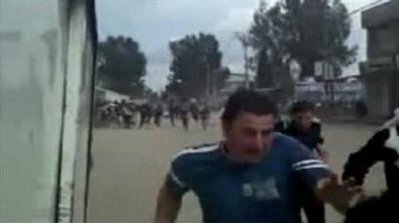 The Syrian state television recently broadcast footage of armed activity in the border city of Daraa by a guerilla group, which opened fire on the people and government forces. It is said that the group, which is affiliated to Salafi movements, obtained its weapons from Jordan and Saudi Arabia. Because Syria's ruling party is from the Alevi tribes associated with the Shias, the Brotherhood, due to its anti-Shia ideas, has tried for three decades to topple the Alevi establishment of the country. Hence, the recent riots in Syria are not just rooted in popular demands and harbor a tribal aspect and Saudi Arabia, Jordan and the US are directing the unrest for their future purposes. Press TV aside, Abdul Halim Khaddam — who used to be Hafez al-Assad's right hand man/fixer before coming up short in the succession struggle — is insisting he’s just letting human nature and pent-up demands for freedom drive events in Syria without any help from him. In this recent picture, Khaddam looks quite comfortable in his plush Parisian digs, purportedly purchased through the generosity of his brother-in-law, King Abdullah of Saudi Arabia and/or acquired as the result of his own billionaire-level business acumen. So maybe he’s just kicking back and letting politics take its course inside Syria. Of course, in his own words he’s “working around the clock to set an executable plan to achieve [his] targets”, but we’re led to believe that relates to the political struggle after popular unrest has kicked the props out from under the Assad regime. He’s also willing to foment anti-Iranian and anti-Shi’a sentiment, something that would please his alleged patrons in Riyadh. A pro-reform activist in Lebanon holds an Arabic placard reading 'Freedom is the freedom of the nation and the citizen', as she stands in front of the Syrian embassy in Beirut, Lebanon, Tuesday April 12, 2011. Q: What are you current priorities? Do you want to reform the regime, reform it, or topple it? A: This regime cannot be reformed so there is nothing left but to oust it. Q: But how will you oust it? A: The Syrian people will topple the regime. There is a rapidly growing current in the country. Opposition is growing fast. I do not want to oust the regime by military coup. A coup is the most dangerous type of reform. I am working to create the right atmosphere for the Syrian people to topple the regime. In another interview in 2006 — the year he optimistically expected the Assad regime to fall — Khaddam elaborated on the theme. Gulf News: On January 14, you announced you would form a government-in-exile that would take over power when the government of President Bashar Al Assad collapsed, but nothing has happened since then. I have contacted opposition forces in London and Washington who welcomed your move but said they have not heard from you. What happened to the government-in-exile idea and are you going to cooperate with the existing opposition forces or form a government of your own supporters? Abdul Halim Khaddam: I am working with different opposition forces which exist inside Syria and in exile. We are discussing the formation of a government-in-exile. Its main task will be to fill the power vacuum in the country and be in action after the collapse of the regime in Damascus. I am discussing my proposal directly with the leaders of opposition factions or through mediators. We are looking to foster and strengthen cooperation among different opposition factions, including Muslim Brotherhood, which are banned by law in Syria since 1980. We will announce a programme for a democratic change in Syria that will include all the topics and the issues to be handled by the opposition in the next stage. We are working round-the-clock to set an executable plan to achieve our targets and to benefit from the blunders committed by the regime in recent years. The regime has handcuffed itself through a chain of fatal mistakes which will help the opposition overthrow the totalitarian regime and launch a democratic era. Khaddam speculated that Assad's regime was being infiltrated by Iran's elite Islamic Revolutionary Guard Corps with Iranian intelligence agents having penetrated the Syrian political and security circles. He pointed to an agreement between Syrian and Iranian security organs, a mutual defence agreement signed in 2006 between Tehran and Damascus and a "broad co-ordination between the security organs in the two countries which covers Lebanon and Syria". Khaddam accused the Iranian ambassador to Damascus of leading the Shi'itisation process in Syria, saying: "Shi'itisation is a political phenomenon carried out by the Iranian ambassador to Damascus with the objective of creating a political situation that is tied to Iran, and this activity is dangerous as it lays the ground for sectarian strife in Syria". 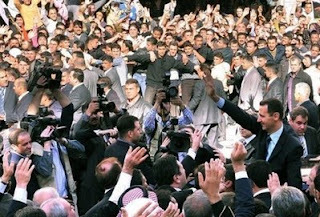 At the very least, Khaddam showed more message discipline that an organization called the Reform Party of Syria. The only conspicuous achievement of the group mentioned on its Wikipedia page was an endorsement of Nicolas Sarkozy for President (of France). Iran has deployed its Islamic Revolutionary Guard Corps in Syria to bolster Syria's defense. The Washington-based opposition group said the IRGC contingent in Syria includes 10,000 troops, with headquarters in the northern province of Homs. "In essence, the IRGC now occupies Syria and has become its de facto ruler," RPS spokesman Farid Ghadry said. "Syria has become the 32nd province of Iran." The Syrian revolution struck home yesterday. My wife, Manar Qash`ur [Kachour], burst into tears last night as she read the Facebook page that has kept her updated on events in her hometown, Latakia. Lt. Colonel Yasir Qash`ur, who was Manar’s cousin and 40 years old, was shot in Banyas on Sunday. He was one of two Lt. Colonels and 10 military personnel killed – more were wounded. Yasir’s funeral was held in the village this morning – Monday. My brother-in-law, Firas, and father-in-law, Shaaban, both attended. ...My father-in-law said on the phone this morning that it seemed that supporters of ex-Vice President Khaddam, who was from Banyas, were behind the attack. It is said that they had set a trap for the military unit. All this is speculation, however. We know precious little about who is killing whom in Syria. Allegations are numerous. Real knowledge is scarce. 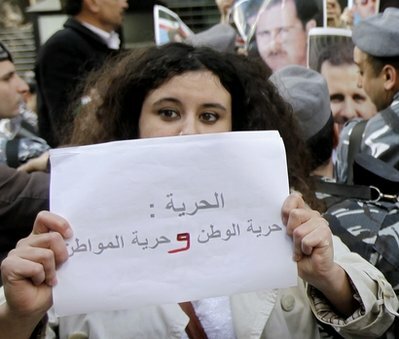 There is a widespread enthusiasm for acknowledging the popular character of the demonstrations against Assad. 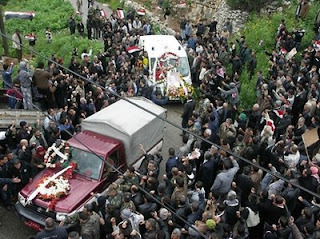 Funeral of Staff Sgt volunteer Ali Ahmed Ali in the coastal town of Banias. There is intense unease about exploring the role of armed provocateurs in trying to foment more extreme anti-government unrest. Al Jazeera — which appears an enthusiastic cheerleader for the Syrian protests, even as it seems to show a willingness to hew to the Saudi line in downplaying reporting on the anti-Sunni crackdown in Bahrain — did run a video segment on Inside Story, Syria: Conspiracies and Condemnation. Judging from the version on Youtube, it was originally called Conspiracy over Syria Protests; perhaps that title was considered to give excessive credence to the government’s claims. To an almost ludicrous extent, the moderator, Nick Clark, tried to get his three panelists to comment on video footage aired on Syrian state TV that showed a white Honda riding down a street in some Syrian town with guys firing automatic weapons out the window. The panelists admitted in passing that it was plausible that gunmen had joined the anti-government protests. Nobody was willing to discuss the implications, preferring to treat the footage of gunmen — true or not — as simply an attempt by the government to misdirect attention away from the genuine protests, and to emphasize that the Syrian state media — and by implication, the government — had lost credibility. That white car, with “a chap hanging out firing a machine gun”, as Clark put it ...zero traction. The possibility that the gunmen were pro-government irregulars has subsequently been floated in the media courtesy of pro-demonstrator spokespeople. A similar vow of omerta seems to apply to the ambush of the Syrian Army patrol that killed Josh Landis's in-law. One would think the death of nearly a dozen soldiers in an ambush would be considered a remarkable development, considering that the death of equivalent numbers of demonstrators is a world media event. It’s also rather shocking that, in an acknowledged authoritarian state like Syria, somebody could come up with the wherewithal to mount a successful attack on a rather sizable military patrol. But even in news for Banyas, the reports of an ambush are virtually a non-story, as the media concentrates on the crackdown instead. On Josh Landis’ site, a pro-demonstrator commenter advanced the story that one member of the unit had killed the rest of the soldiers in a fit of patriotism, rather than fire on demonstrators. If reports in Syrian media are truthful, this would have been a remarkable display of determination and marksmanship. In addition to nine dead, twenty three were wounded. Admittedly, Nidal Malik Hasan killed and wounded more at Fort Hood, but those victims were on base and unarmed; the Syrian soldiers were on patrol and presumably within reach of their weapons. Mazin Fittimi reported that he was sitting in the front part of the convey when armed men ambushed and rained them with bullets and grenades from nearby buildings and water sewage canals at 'Al-Qwz Bridage'. In the Arab press, Khaddam asserted that his home town of Banyas had a long history of repression, persecution, discrimination and marginalization and “don’t need anyone to guide them”. Whether or not Khaddam is Saudi Arabia’s Chalabi for Syria doesn’t get a lot of airing in the regional press. Whether or not he has assets in his home town that would mount an attack on a government convoy is apparently not a matter of widespread interest. And that doesn’t even go into the matter of Rifaat Assad, Hafez Assad’s brother — and Bashar Assad’s uncle — who tried to take over in a coup and was exiled to France. Rifaat is also married to one of King Abdullah’s sisters. So that means that the former Number 2 and Number 3 in the Syrian regime are both eager to see Bashar fall on his behind; and both are close to Saudi Arabia, which now appears to be, more than ever, willing to take positive action to sideline its enemies. Of course, the Assad regime, as the al Jazeera panel pointed out, has been counterproductively coy and vague about the conspirators it claims are dead-set on undermining the government. Is the Syrian government just blowing smoke? Trying to build a persuasive case before they name names? Afraid to provoke an open breach with the Saudi and Jordanian governments by publicly accusing Khaddam and Rifaat Assad? These questions might be worthy of some more media attention. the meaning of " Mafia"
"Saad Hariri is a 'Yes Sir' man!" "..loss of Syrian support would be painful .."